In this remarkable DVD, Paul explores the subtle aspects of the chakras, or energy centers of the body, with his signature clarity, humor and wisdom. Includes special guided chakra meditation practices. Suitable for all levels. Join internationally acclaimed yoga teacher and scholar Paul Grilley for an extraordinary presentation on the chakras and the yogic path of the spirit. Never before has this knowledge and these priceless practices been presented with such clarity, brilliance and accessibility. 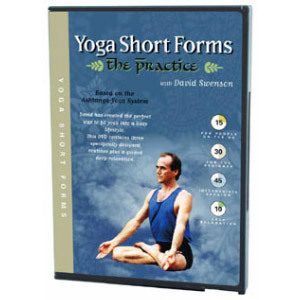 This DVD is destined to become a seminal guide to spiritual development. Chakras are subtle centers in the brain and spine that regulate the physical, emotional and psychic flows of energy through the body. The fundamental premise of Hatha Yoga, Tantra Yoga and Taoism is that these energies need to be brought into the yogi’s awareness and control if the mind is to be calmed and the authentic Self revealed. This groundbreaking DVD outlines the basic anatomy of this essential energy system and its operations in the physical, astral, and causal bodies. The unique characteristics of each chakra are described in four specific dimensions: physical location, organs they control, emotions they express, and mental characteristics they embody. These ideas give strong theoretical support and general guidance for those who wonder how and why chakra meditation should be done. Along with nearly 4 hours of in-depth theoretical presentation of these concepts, Paul offers specific physical and energetic practices to develop awareness of the chakras, and describes the karma that is associated with each one. This is followed by meditation techniques that aspiring yogis may use to purify the karma that operates through each chakra, achieving a deeper understanding and appreciation for the powerful role these elements play in our lives. These guided meditations include Listening to Nada Sound, Ham-Sa / So-Hum Mantra, Soshumna Purification, as well as individual bandha techniques for each chakra. As a special bonus, we’ve provided MP3 versions of all these meditations in a data folder on the DVD. These files are only accessible on a computer that is capable of reading DVD-ROM content. You should be able to play these meditations on any MP3 compatible player. “This DVD is Paul’s best yet. With 5-1/2 hours of lecture presentations and 12 different guided meditation practices, it represents fantastic value. The lectures cover an overview of Tantric theory and the goals of spiritual practice, with detailed discussion of the functions of each chakra. The lectures are densely packed … but the clarity of the subject matter is amazing, and he appears effortlessly and in simple language to be able to link together so much of the underpinning philosophy of yoga, and to paint a holistic view of the oneness of yoga science. There is a way out. 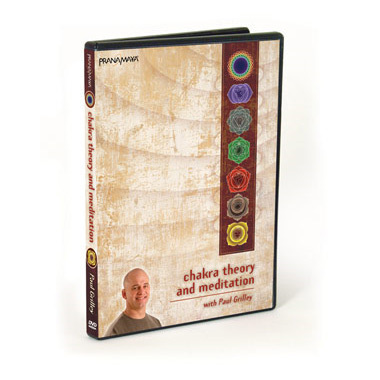 In the lectures and practices on his new DVD Chakra Theory and Meditation, Grilley convinced me that one method of escaping the aforementioned fate involves awakening the chakras through meditation. The practices Grilley teaches illuminate what needs to be examined in our lives in order to transcend the physical body and create a conscious, unending and blissful experience. This is a heady subject, indeed. Chakra Theory contains four hours of theoretical lectures describing the seven primary chakra centers, which are the spiritual wheels of energy located in the subtle body in the areas of the brain and spine. These control the flow of chi or prana, our lifeforce. Grilley explains what each chakra governs and how to access them energetically. Fortunately, his lucid and accessible explanations are captivating throughout. Viewers eager to incorporate theory into practice will enjoy the series of nine-minute guided meditations, manageable alone or as a grounding entry into a longer meditation session. More intricate practices involve integrating the bandha (energetic locks). Special features offer recommendations for further study. In the summer of 1979 Paul Grilley was inspired to study yoga after reading Autobiography of a Yogi by Paramahansa Yogananda. After two years study of anatomy with Dr. Garry Parker, he relocated from his home in Montana to Los Angeles to continue his studies at UCLA. During his thirteen years as a yoga teacher in Los Angeles, Paul studied Taoist yoga with martial arts champion Paulie Zink. He also had the opportunity to study with Dr. Hiroshi Motoyama in Japan, as well as host seminars with him in the United States. After twenty years of reading and study in the philosophies Taoism and Yoga, Paul took a sabbatical from teaching and completed a Master’s Degree from St. John’s College in the study of the Great Books of the Western World. Paul enjoys reading in esoteric subjects and science, continuously looking for bridges between these two fields of study. He lives in Oregon with his wife Suzee.